A player was injured and then escorted off the field. That's when the opposing teams came together for a quick prayer. They were joined by the cheerleaders and both coaching staffs. PEARCY, Ark. (KTHV) – Two opposing football teams are showing just how strong the love is for our fellow Arkansans. A Nashville Junior High School football player is recovering after an injury during a game on Thursday night. The team kicked off its 2018 season against the Lake Hamilton Wolves in Pearcy on Thursday, August 30. A player was injured and then escorted off the field. 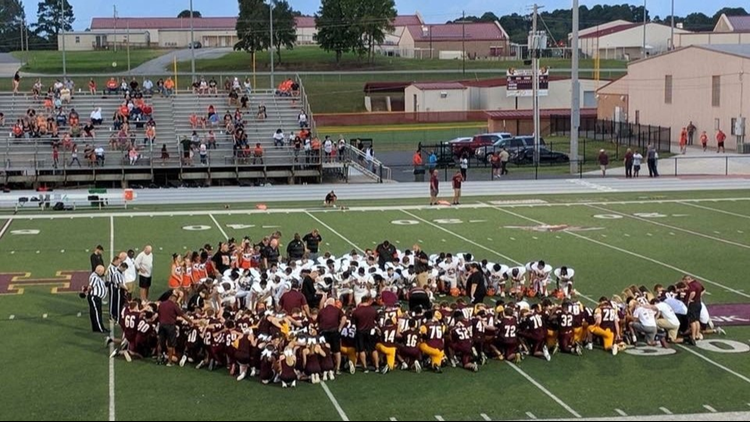 That’s when the opposing teams came together for a quick prayer. They were joined by the cheerleaders and both coaching staffs. Lake Hamilton parent Kevin Wolf took a photo of the touching moment and shared it with THV11. Wolf said the student left the field in an ambulance. Nashville Head Coach Rick Baker told THV11 the medical response was mostly precautionary. "Our player is back home today and resting," said Baker.